Cob Jockey: Jumping, at Long Last! I knew that the day I got to the barn with my brand new Dressage schooling pad that she would tell me we were jumping today. Of course! But I was ecstatic to jump for the first time since September, and it turns out, I wasn't the only one: Connor was thrilled! "I don't like it blue, I like it brown." He's such a hard worker and amenable fellow that sometimes I wonder if he really enjoys what we do. It's hard to tell. There was no wondering today, though, as he was super in front of my leg, giving me random canter departs while trotting, and taking fences like a champ. His little motor ran out after a while, since we haven't jumped in so long, but there was no mistaking his enthusiasm: he knew why those jumps were there and why he was wearing that saddle! 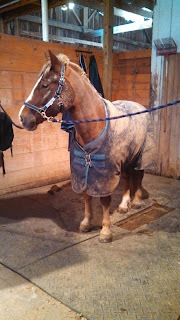 He was snorting like a racehorse as I warmed up off his back in the canter. We worked primarily on me keeping my reins short - really short, almost to the end of the rubber short - so that his head stayed up where it needs to be. When we got Dressagey and the reins got long, he put his head down and didn't see the fences til the last second. But when I rode well, he jumped well. Really well. And he landed on the correct lead most of the time! I needed to be reminded to sit more forward after months of Dressage purgatory, but the adjustments we made to my leg in the Dressage saddle made just as much sense in the jump saddle, and really helped me keep his hind end engaged with my newly effective and stable lower leg. Bend the knees and sink into them, use your seat to bring him back, package him from back to front. It surprises me that the adjustments made to my leg in the deep Dressage saddle with my stirrups so long helped so much in the jump saddle, but they did. Happy pony, happy rider, happy trainer. It was a good day. Sounds like a great lesson! Dressage purgatory paying off! I do love Dressage, but it is definitely purgatory when it's all we do for a long time!